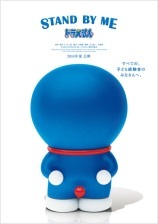 In August 2014 Stand by Me Doraemon 3D computer graphics film was released in Japan with a huge success. The film is based on award-winning manga series, counting its history from 1969, and features the Doraemon character – a clumsy chubby robot cat from future. The movie stayed on the top of the Japanese weekend box office for 5 weeks. The 3D version of the film was created with a hybrid approach. A significant portion of the footage—more than 30 minutes—was successfully converted from 2D source by a small conversion team using 2D to 3D Suite tools. The entire conversion took few months in 2014. As of September 28, the gross box office of the film notched $72 mln, thus easily beat the Japanese box office of Godzilla (2014) movie, featuring another local pop culture character. Releases in other countries are planned for the end of 2014.